Interesting post, Praveen. In public opinion, dictionary meaning of terms do not matter. Web is not a court. And it is not that the majority of people in India have become intolerant of minorities. BJP is too piddly a force to dent hindus at large.There are just a few bums but they happen to be in positions of power. When a minister or a governor says that ‘hidoosthan is for hindus’, or ‘those who want to eat beef or do not like Modi should go to Pakistan’, the PM should say ‘shut up else I’ll send cancel your nationality’.If Manmohan S were the PM, his silence on this would have been understood because he was naturally silent. But a PM who even tweets ‘ggod health’ to an ailing ex-cricketer will be asked ‘Why not, Modi?’. When he clarifies his acceptance by his silence, other third raters get the clue and an Akhlaq is murdered. Sir, Thank you for sharing your opinion. Exactly – “dictionary meaning of terms do not matter” unfortunately for many including the intellectuals of India. Chidambaram recently said banning Satanic Verses was wrong. May be 25 years from now we will say banning Vishvaroopam scenes (7 in total) was incorrect. My friend whose comments are referred in my blog gave me example of PK that I might have liked it 7 years back. I watched PK on big screen (helped it get 500cr), because whenever there is a controversy I try to defy that. I did the same for Vishvaroopam, though I do not like violence based movies (except The Matrix, Star war type of concept based movies). 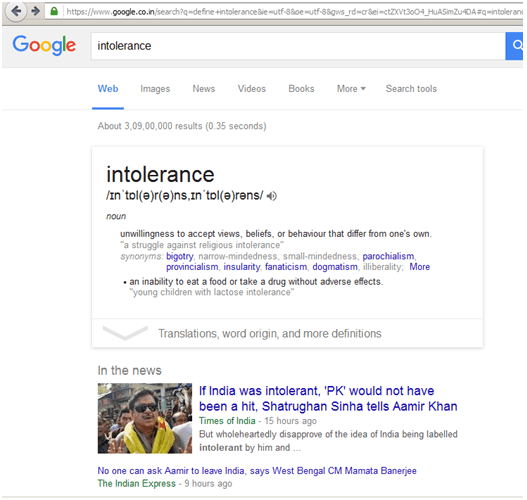 In the image above Shatrugna Sinha made exactly the same comment – PK was a hit because India is tolerant. I would go a step further – Vishvaroopam removed scenes because India is tolerant and Kamal Hasaan removed the scene however much it impacted the script and business loss. India is not like USA of 1989 when The Last Temptation of Christ was banned. I am still maintaining that India has not changed in last 2 years, we are equally intolerant to many things whether its banning Salman Rushdie book, Blackening Taslima Nasrin or banning books on Baba Ambedkar or Shivaji. Lastly, if people (not just you) are converting all this into a Con Vs BJP battle – do we have an option in the national level embarrassment we see often? Once again, I reiterate that it is NOT about Indians/hindus in general. Is about the few leaders who issue senseless statements and then the otherwise vociferous PM refuses to admonish them publicly. It doesn’t change the generic nature of otherwise very tolerant hindus. BJP is too piddly a force to damage hinduism. But they are in power in enough numbers for the rabid ones appearing as the representative of people which they are NOT. So blame the bums, not hindus/Indians. The problem with the latest problem is that from a few particulars generalisation has been made. At the ground level, among common folk there is no intolerance and that is all that matters. I agree with your point of view. However there are people getting carried away and media adding more fuel to the fire. That is why the post, otherwise I would have moved on to business, economics, spirituality et al topic over this weekend.